On the 22nd November we were lucky enough to invite an author into school for the day. 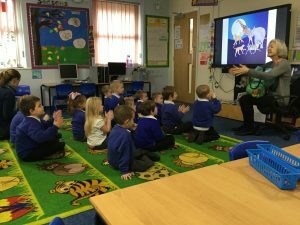 Gail Clarke is a children’s author, illustrator and storyteller and she spent the day with us sharing her love of books. All classes benefitted from her time and she enthused and inspired us all with her story telling and chats. We are extremely lucky to have welcomed Gail into our school and we all had a fantastic day.